However, The Cleveland Leader did some digging around in the internet archives and found some information that was recently erased by ACORN. Evidently, the Obama Campaign was thinking this information had been airbrushed away for good. ACORN members meet with Illinois Senate candidate Barack Obama in 2004. Photo as printed in 2004 Social Policy article. The Obama Campaign made 3 statements on Obama’s ties to ACORN at the Fight the Smears website. 2 of them are found to be outright lies from this article. While Barack Obama’s connection with the Association of Community Organizations for Reform Now (ACORN) has not gone entirely unreported, it has not been fully explained. Most media background pieces simply note Obama’s involvement in a 1995 lawsuit on behalf of ACORN. Obama’s own website, as well as most major media, fail to reveal the full depth and extent of his relationship with the organization. Is that really a FACT, or just another lie? 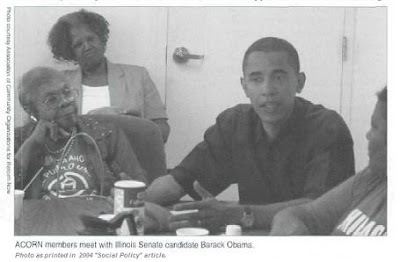 Let’s take a look at a quote from a 2004 article – Case Study: Chicago- The Barack Obama Campaign – written Toni Foulkes, a Chicago ACORN Leader, which was published in the journal Social Policy. Did we mention that Social Policy recently pulled this particular article from their website, while leaving links to all articles up? Not only does Foulkes boast of Obama’s ACORN leadership training, but also makes it clear that Obama’s post-law school organizing of “Project VOTE” in 1992 was undertaken in direct partnership with ACORN. 2 out of 3 statements are outright lies. Riehl World View has more.